I’m playing with AutoIt3 to make the background of some application transparent with the Win7 Aero Glass. 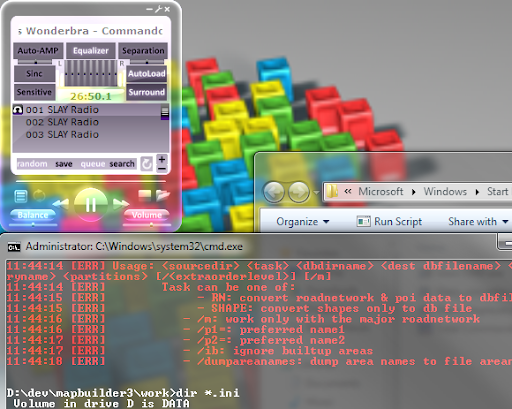 On this screenshot you can see a transparent cmd.exe made with Glass cmd.exe by Komalo, and XMPlay (with Flat II Indigo skin) using a modified Komalo’s script. This entry was posted in Uncategorized and tagged autoit, glass, Windows. The Monochrome competition is over, but I continue to work in my entry: Monolings . It’s still not playable, I got it worked under Pocket PC again and added buttons for the commands like basher, blocker, digger etc. I also removed password protection for page Ideas. This entry was posted in Projects and tagged Monolings, OpenGL, PocketPC, wince, Windows. glbasic.de‘s competition is over. Easter Quest is finished in 8th place. This entry was posted in Projects and tagged Easter Quest, glBasic, GP2X, Pocket PC, wince, Windows. I uploaded some of my projects: Gluglu and Easter Quest. This entry was posted in Projects, Uncategorized and tagged Easter Quest, glBasic, Gluglu, GP2X, Java ME, PocketPC, Projects, wince, Windows, WIP.